UPDATE: Due to the inclement weather, Relay For Life will have a delayed opening starting at 7:00 pm. 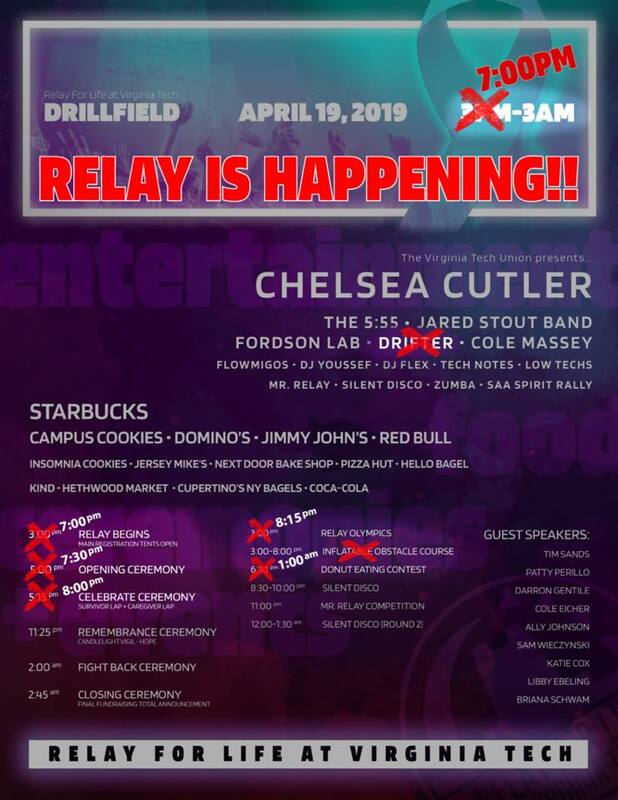 Virginia Tech Relay For Life presents their 2019 Annual Event on Friday, April 19, 2019 on the Virginia Tech Drillfield. Here's a link to the updated schedule: https://i.imgur.com/GfW6CIb.jpg. Relay For Life at Virginia Tech is a year-long, record-breaking fundraiser that benefits the American Cancer Society and culminates in this annual event. The Virginia Tech Relay is the largest collegiate Relay for Life in the nation, raising nearly half a million dollars for the American Cancer Society every year. 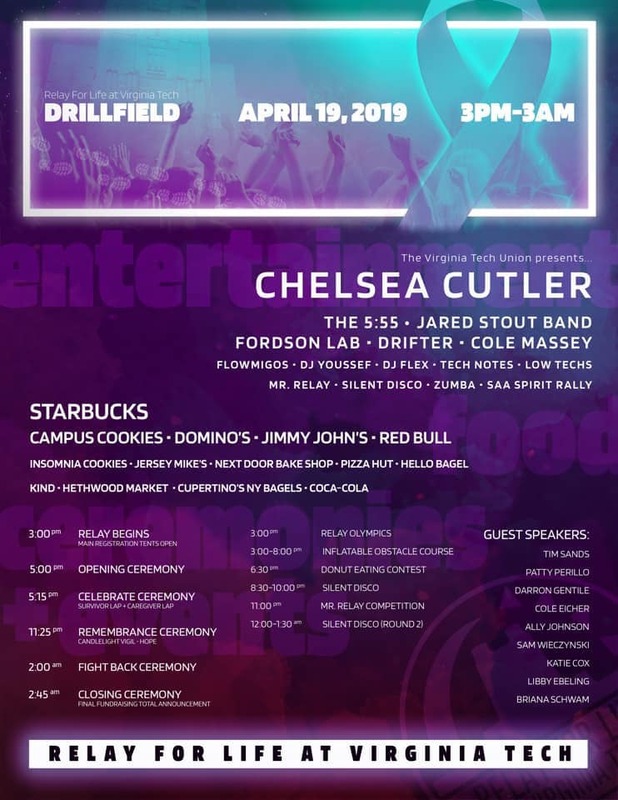 The event features food from numerous restaurants, games, inflatable obstacle course, guest speakers including President Tim Sands, zumba classes and live performances from multiple bands and organizations including Chelsea Cutler presented by the Virginia Tech Union. In addition to the fun and games, we take time throughout the night to honor those who are fighting cancer and remember those who have lost their battles. We celebrate the strong survivors and build courage with our loved ones to fight back against this terrible disease. Hailing from Westport, Connecticut, Chelsea Cutler is a singer, songwriter, and producer of introspective EDM. A multi-instrumentalist, she grew up making music but became interested in recording and production at the age of 17. Cutler began uploading covers of artists spanning the Tallest Man on Earth and ODESZA in 2014, and as a freshman at Amherst College, she shared the original song "Anything for You" in late 2015. "Wake Up" followed in 2016 as Cutler started to be featured on songs by EDM and indie electronic acts such as Kidswaste, Louis the Child, and Kasbo, garnering millions of streams between them. In 2017, her own songs "Your Shirt" and "Sixteen" were met by a growing fan base, and Cutler scored a record deal with Sony affiliate Ultra Records. Her debut on Ultra, "You Make Me," was released in August 2017 and hit the Billboard viral chart just as Cutler began her junior year of college. There is a $15.00 registration fee per person. Some activities and food may have additional costs. Donations accepted. All proceeds benefit the The American Cancer Society, the largest non-government, not-for-profit funding source of cancer research in the United States. So far this year the American Cancer Society has approved funding for 93 research and training grants totaling $40,277,750 in the first of two grant cycles for 2019. This year's goal for the Virginia Tech Relay is to raise $472,000.00. To view the event flyer, visit: https://i.imgur.com/2sztv5a.jpg. For more information, visit: https://www.facebook.com/VTRelay or http://main.acsevents.org/site/TR/RelayForLife/RFLCY19SER?pg=entry&fr_id=90958.